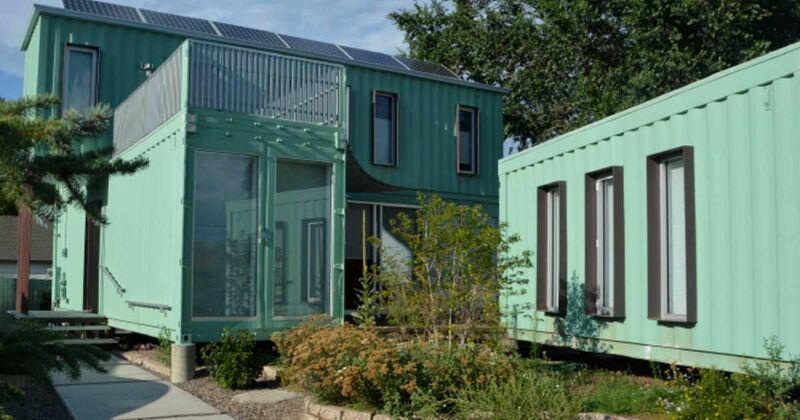 Built in Flagstaff, Arizona, the Flagstaff Container House is the first container home in the state. 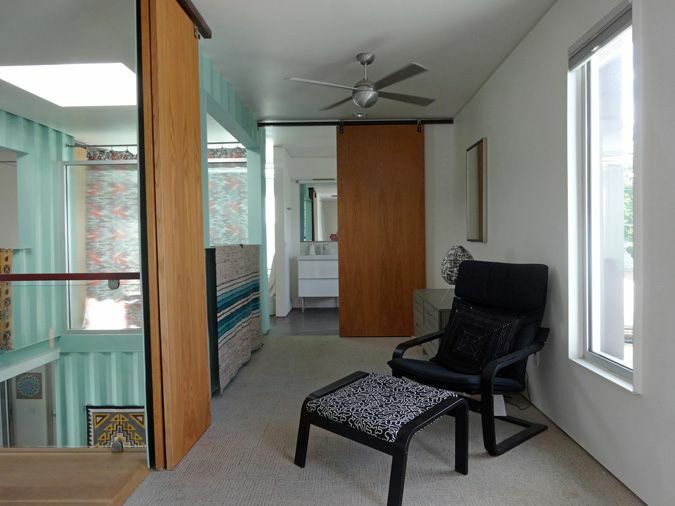 No wonder it's featured on Boutique Homes, a collection of architectural gems, for vacation rentals. 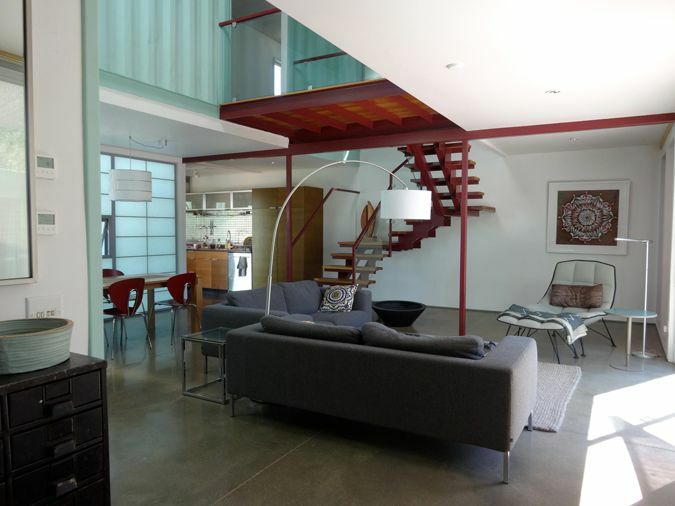 Created from six containers, the home provides 2,000 spacious square feet of living space, which obviously means it's not a tiny home. However, the uniqueness of the building is more than worth the visit. Begin your tour by seeing how the dreamy, mermaid-green exterior gives way to a light, bright and cheerful white interior. 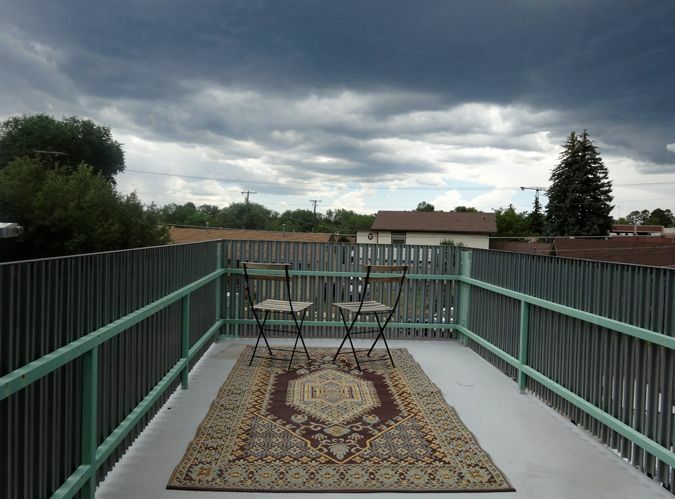 Multiple patios and decks give you plenty of places to enjoy the outdoors and soak in the sunshine. The eco-friendly home also boasts its own greenhouse. 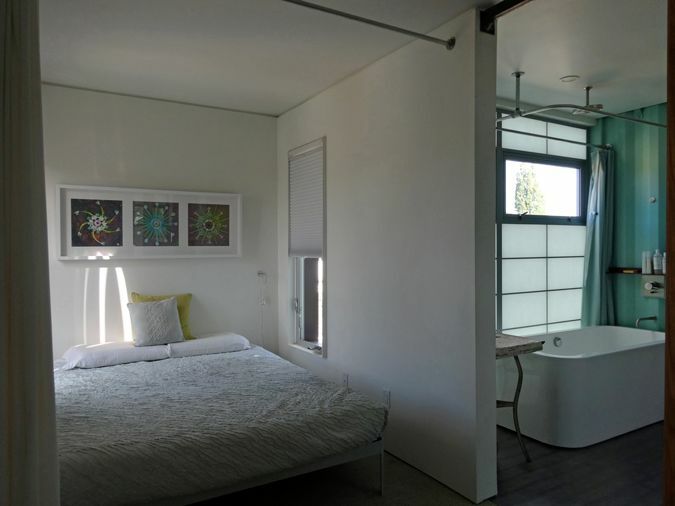 Solar power fuels the home, and biofoam insulation and dual pane windows keep the rooms cool during the summer and warm during chillier months. Check out the sun-filled living room, a tantalizing spot to while away the afternoon! A modern kitchen is equipped with everything you need, including a sink, range and full-sized refrigerator. Overhead, custom cabinets are space-saving storage spots, and you'll find plenty of drawers and cabinets under the countertops. Floor-to-ceiling windows let in a beautiful stream of light during the day. 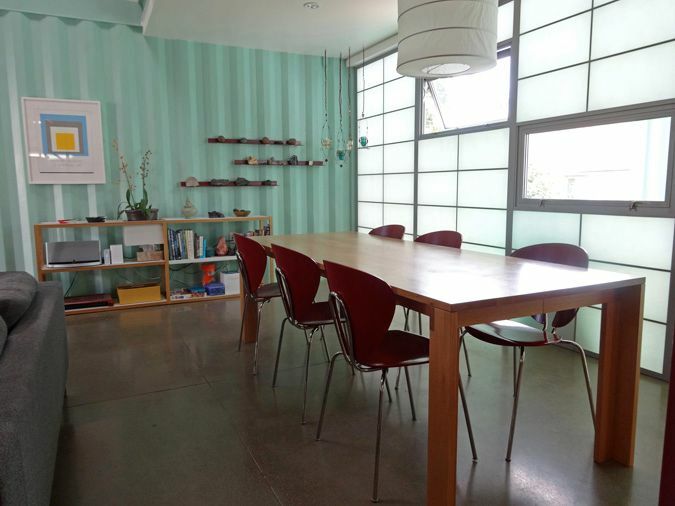 The exposed shipping container makes for textured, funky walls. The dining room features an atrium design with an open feel and a light, bright vibe. 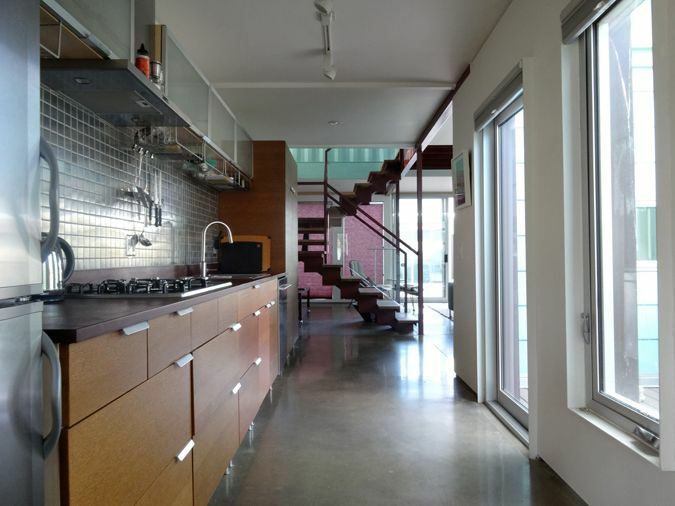 Double-paned aluminum windows let in light without adding heat. The translucent element looks cool and contemporary. 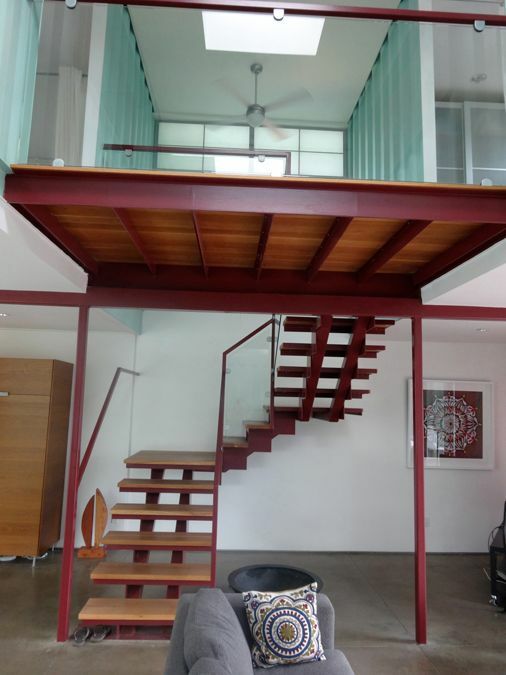 A winding wooden and metal staircase leads upstairs to the two bedrooms. A sitting room divides the upstairs area and provides a small space where you can sit and relax. 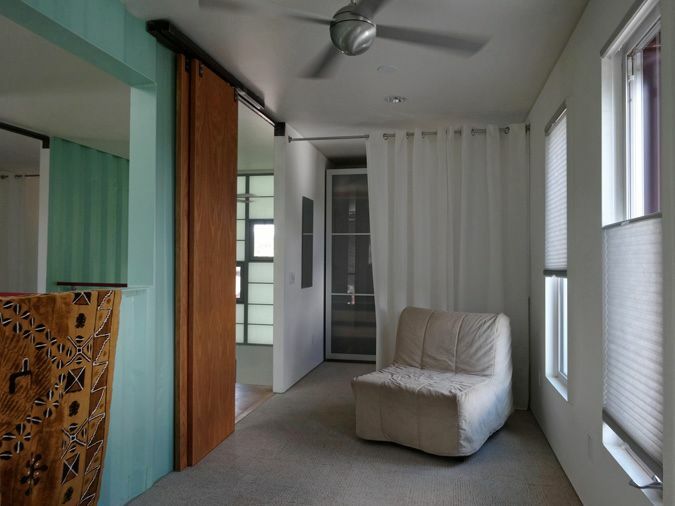 Both bedrooms are proportionally sized, with a bathroom centered between them for added convenience. 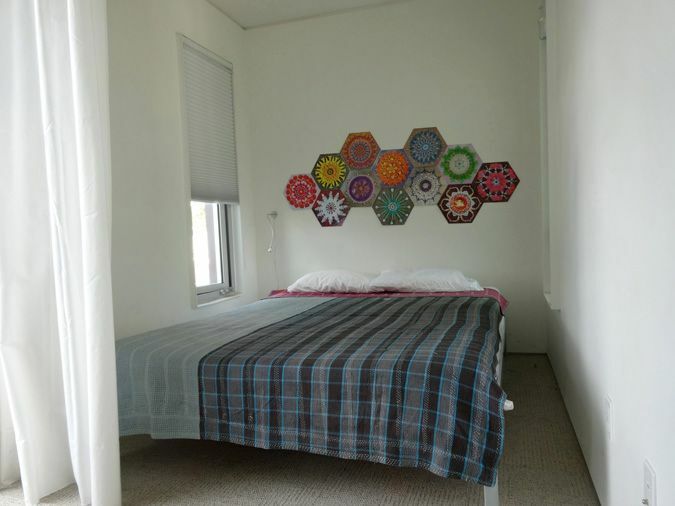 The second bedroom offers a white interior with colorful wall decor. 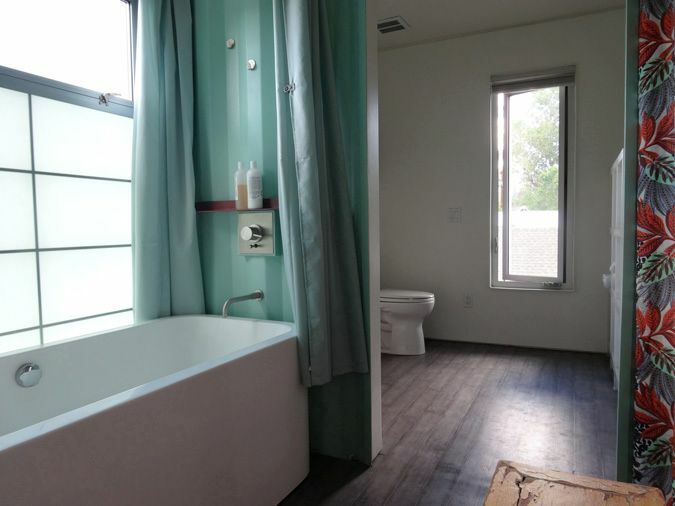 The bathroom has an oversized tub along with a shower, and to add privacy, the toilet and vanity are on the other side of the wall. Wooden floors look rustic and shabby chic, and windows allow glorious sunlight. The windows, skylights and doors make this home stand out and give it an upbeat feel. The upstairs hallway has room enough for seating space along with decorative cabinets for added storage. 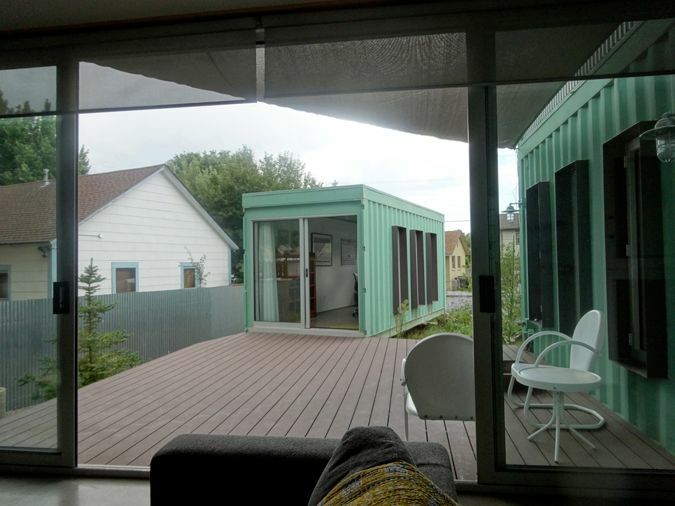 Outside the house, you'll see a lovely deck and the surprising bonus of a container that isn't connected to the main house. This is used as an office space or an art studio. Climb up to the roof and enjoy the view like you've never seen it before!